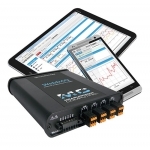 This category contains multi-channel products which can be used in remote locations in the field, such as to monitor turbines, storage tanks, flow rates etc. Data can be downloaded via various methods including GPRS/GSM Modem. Some of the units have an integrated webserver, which displays configuration, data download and data display in a Web Browser.